Start off your visit on the 11th (Wed): admire the landmark architecture of Sheesh Mahal (Hall of Mirrors), admire the landmark architecture of Amber Palace, and then explore the historical opulence of Jal Mahal. On the 12th (Thu), you'll have a packed day of sightseeing: see the sky in a new way at Jantar Mantar - Jaipur, then get engrossed in the history at City Palace of Jaipur, then admire the landmark architecture of Hawa Mahal - Palace of Wind, and finally indulge in some personalized pampering at some of the best spas. For reviews, traveler tips, other places to visit, and other tourist information, read our Jaipur trip planner . Pune to Jaipur is an approximately 2.5-hour flight. You can also drive; or take a train. Expect a daytime high around 41°C in September, and nighttime lows around 28°C. Finish up your sightseeing early on the 12th (Thu) so you can go by car to Agra. Kick off your visit on the 13th (Fri): step into the grandiose world of Agra Fort, then don't miss a visit to Jahangir Mahal, and then admire the landmark architecture of Taj Mahal. To find maps, other places to visit, reviews, and tourist information, refer to the Agra itinerary maker tool . You can drive from Jaipur to Agra in 3.5 hours. Other options are to take a train; or take a bus. In September in Agra, expect temperatures between 41°C during the day and 29°C at night. Cap off your sightseeing on the 13th (Fri) early enough to travel to Kannur. 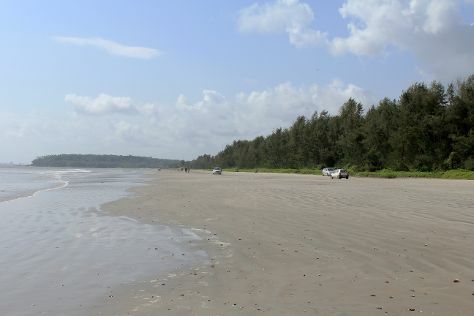 On the 14th (Sat), stroll through Muzhappilangad Drive-in Beach, then kick back and relax at KIzhunna Beach, and then relax and rejuvenate at some of the best spas. To find more things to do, traveler tips, where to stay, and more tourist information, you can read our Kannur road trip website . Traveling by combination of train and flight from Agra to Kannur takes 9.5 hours. Alternatively, you can do a combination of train and flight; or drive. Finish your sightseeing early on the 14th (Sat) to allow enough time to travel to Kovalam. On the 15th (Sun), relax and rejuvenate at some of the best spas, then kick back and relax at Lighthouse Beach, and then kick back and relax at Kovalam Beach. For other places to visit, photos, reviews, and more tourist information, go to the Kovalam tour itinerary maker app . You can fly from Kannur to Kovalam in 5 hours. Other options are to drive; or do a combination of train and flight. In September, plan for daily highs up to 35°C, and evening lows to 28°C. Wrap up your sightseeing on the 15th (Sun) to allow time to travel back home.